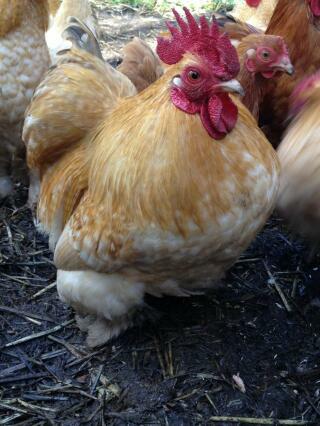 They are very cute and fat and lay good eggs. 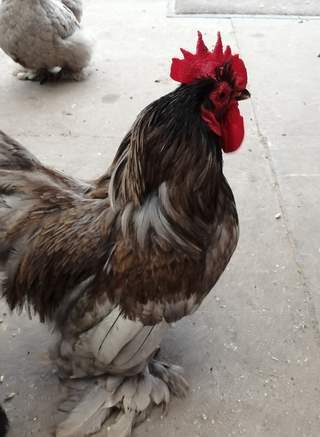 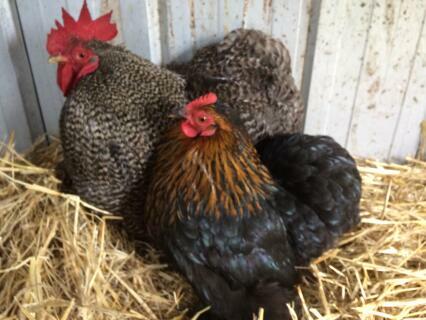 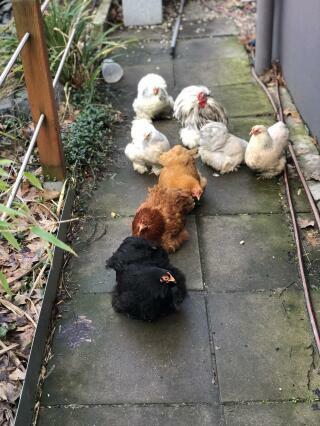 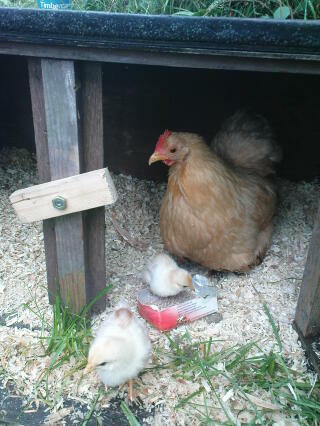 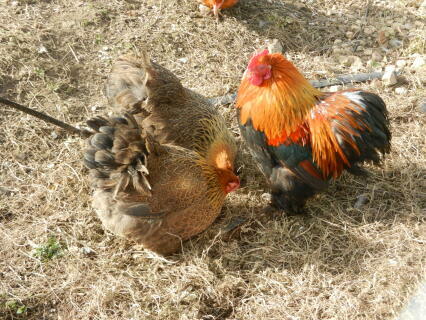 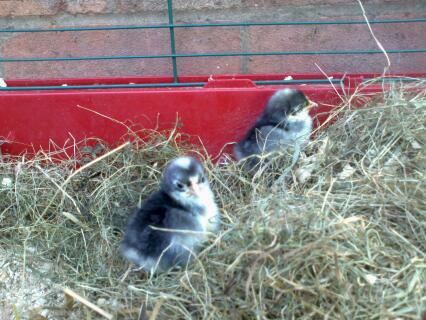 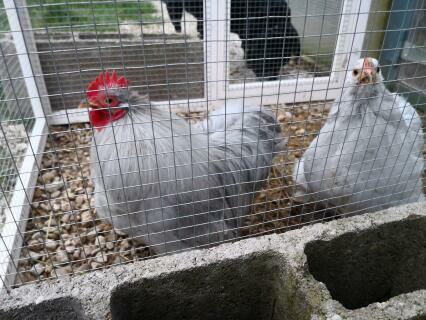 They aren't very loud, apart from the daily crowing by the bigger roo. 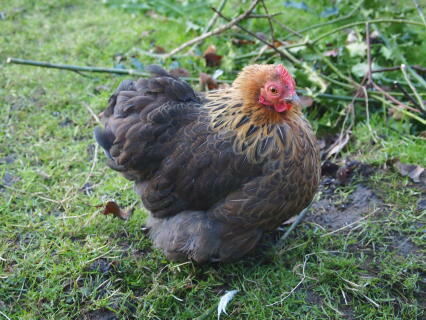 They don't ruin flowers, but they poop a lot in the garden. 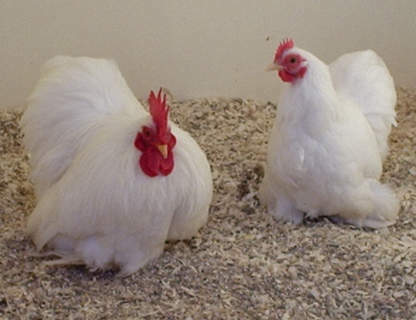 I dealt with Gerrit Bosch in Holland for eggs after seeing his prize buff trio win all out European cup. 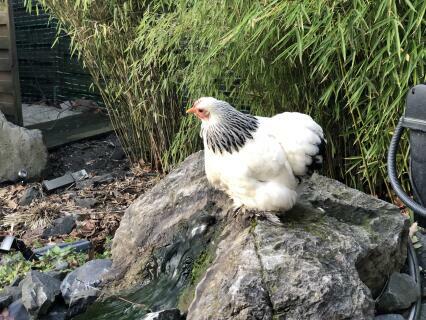 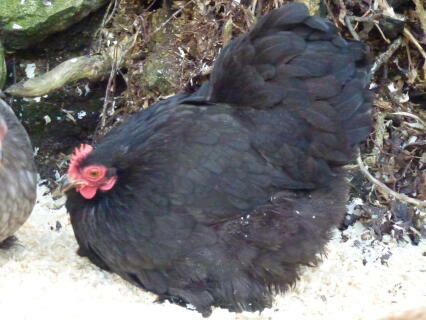 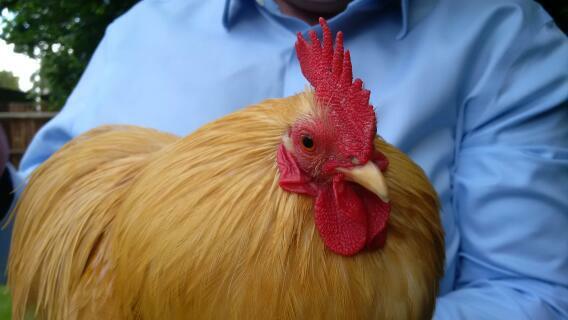 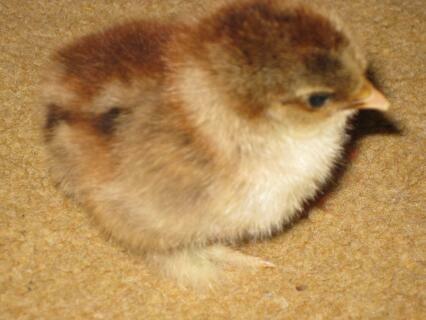 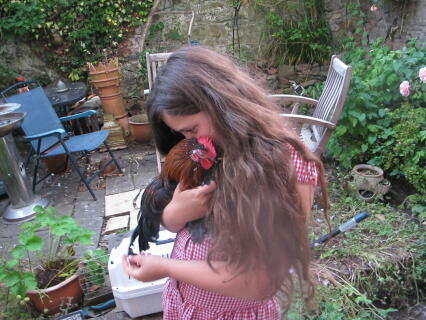 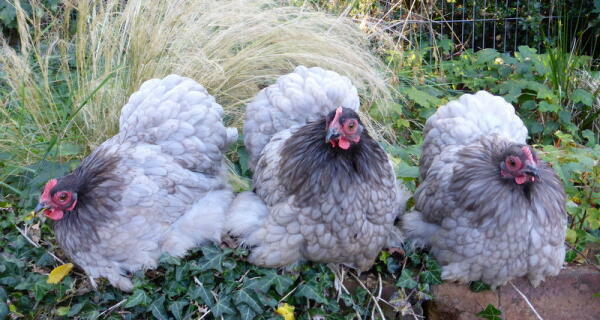 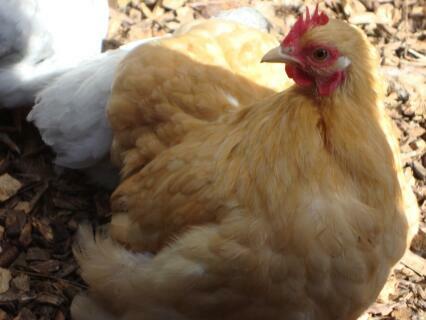 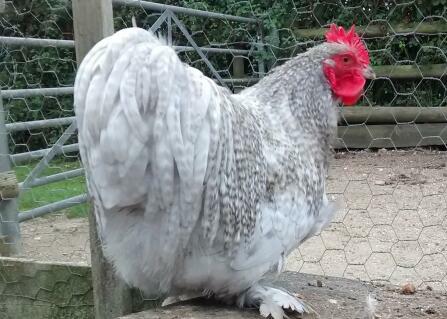 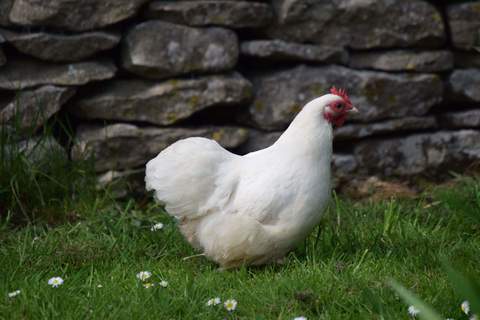 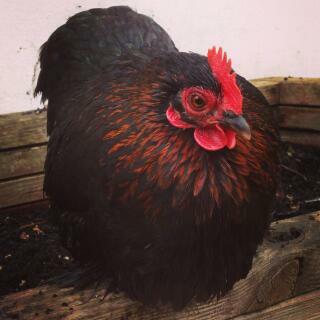 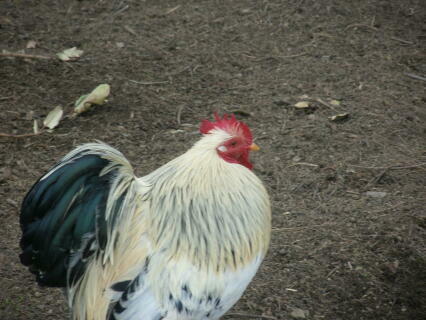 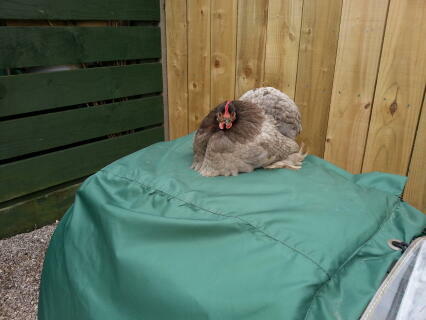 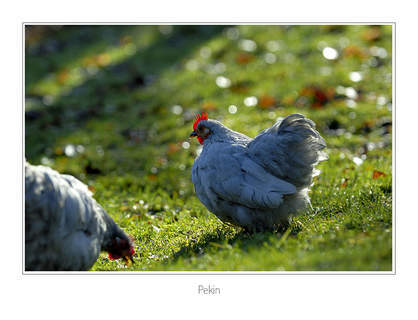 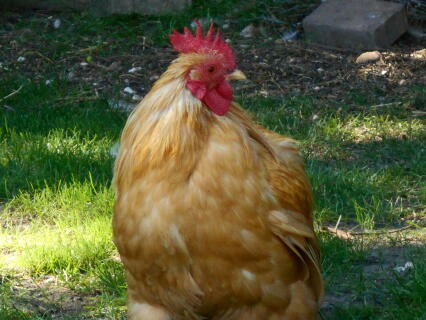 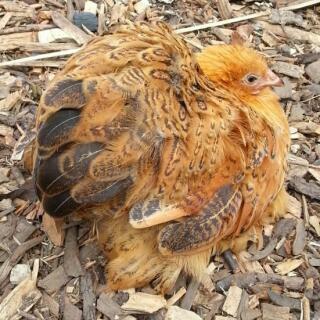 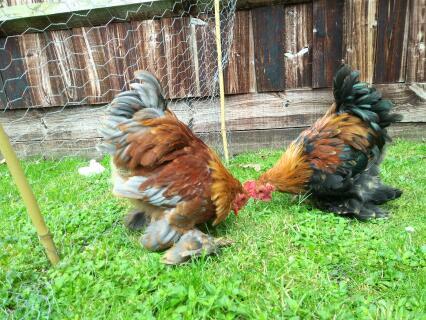 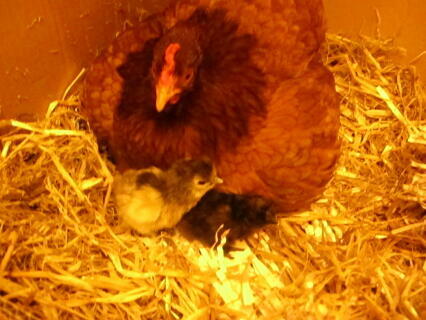 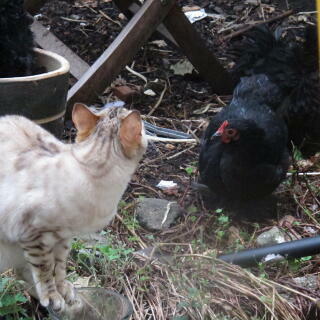 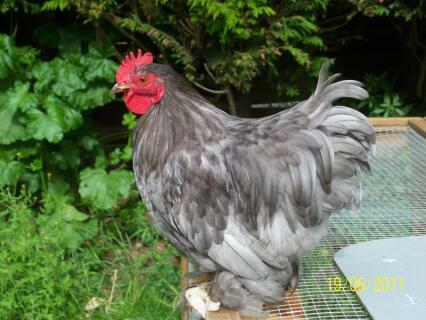 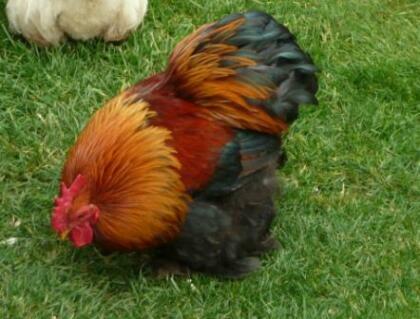 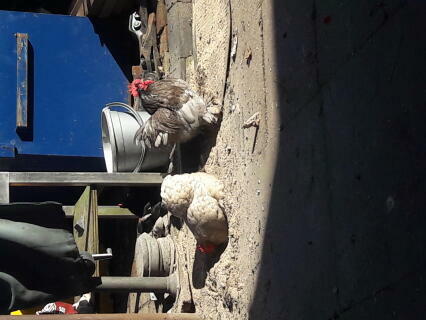 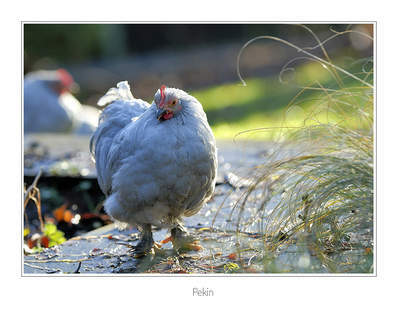 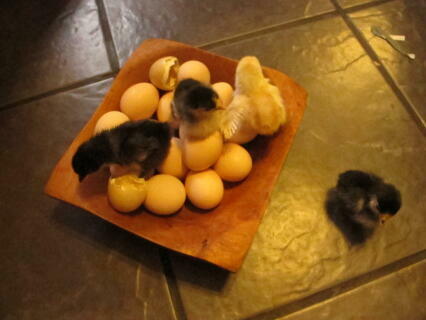 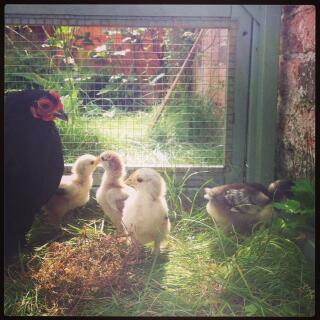 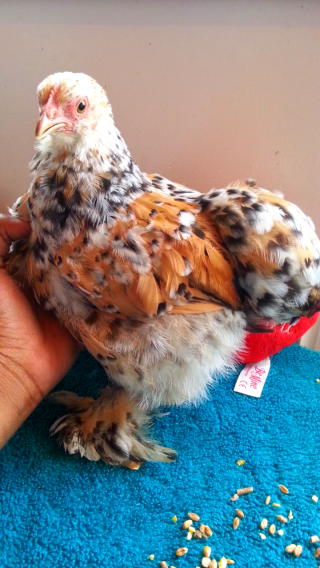 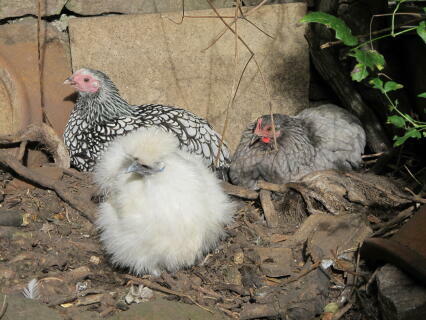 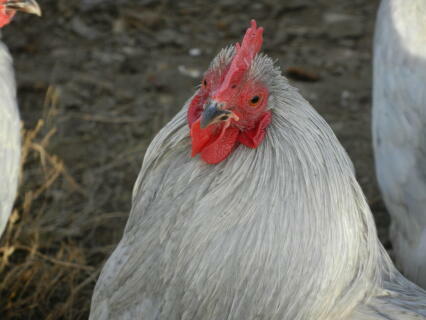 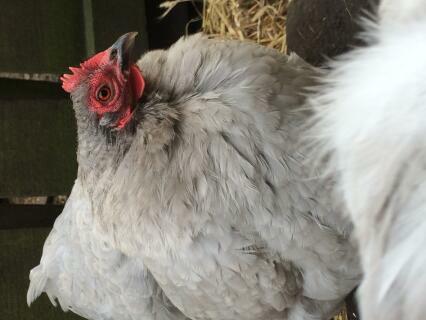 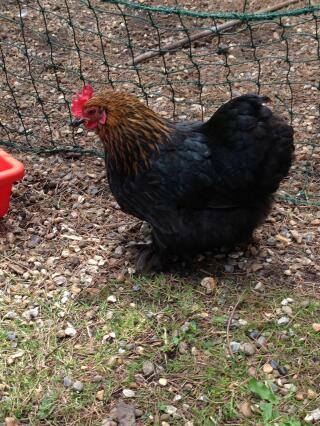 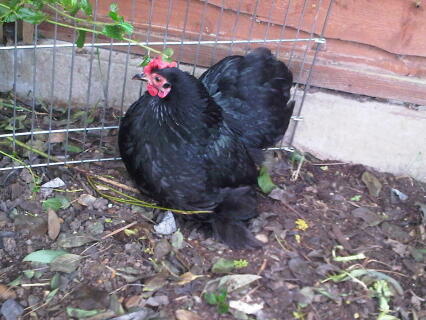 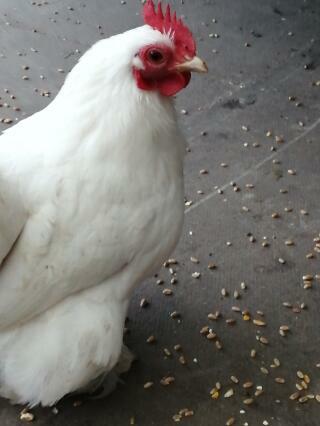 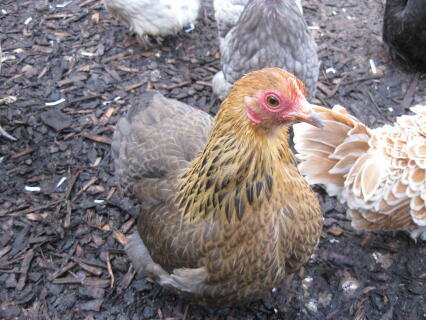 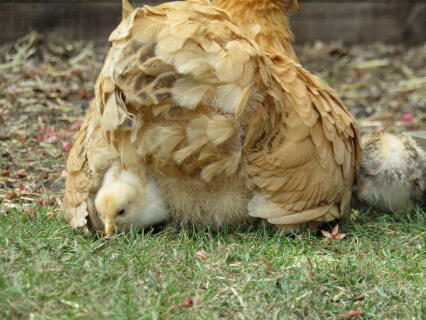 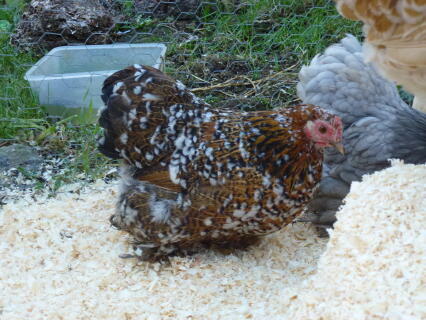 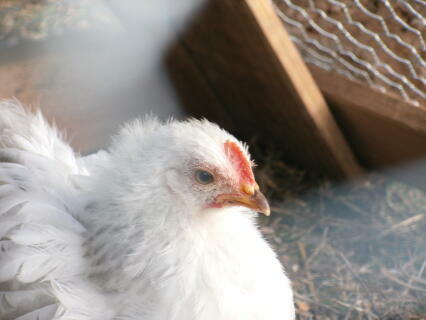 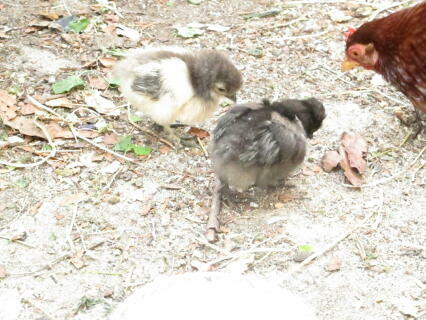 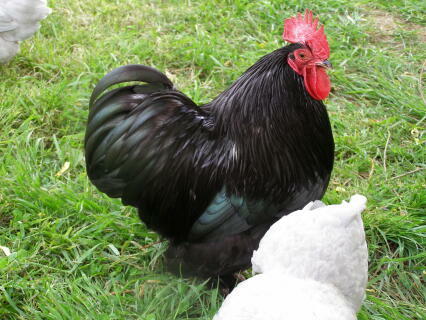 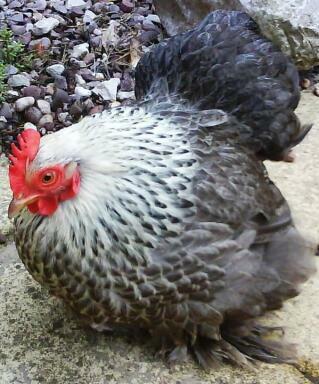 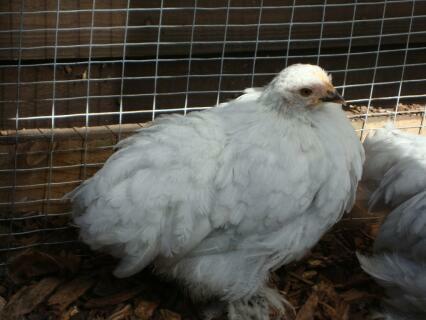 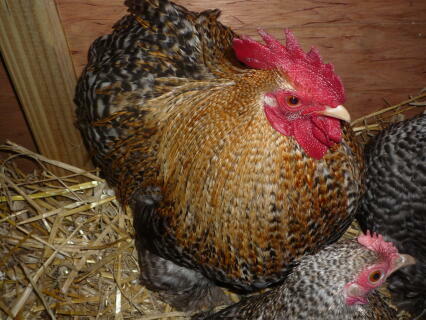 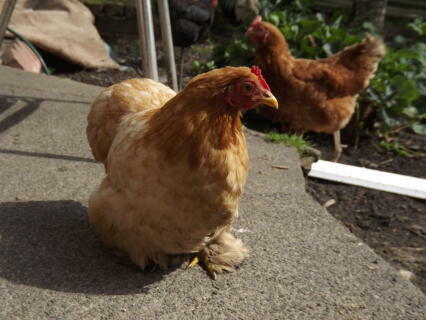 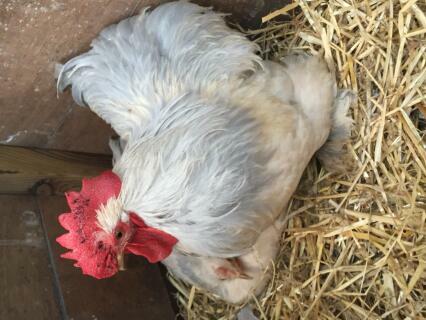 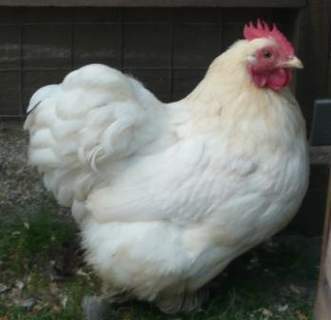 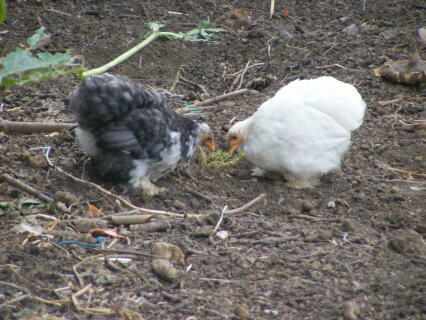 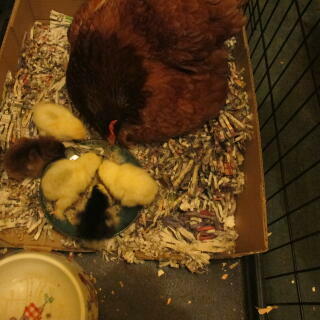 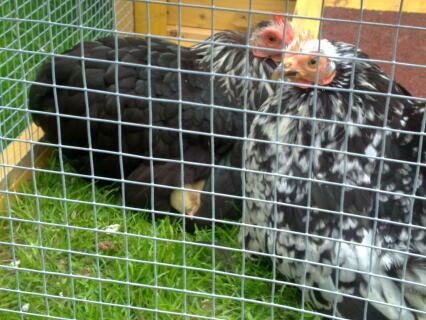 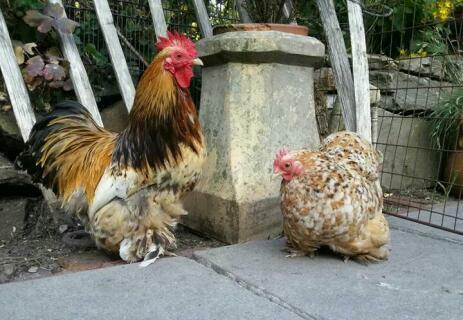 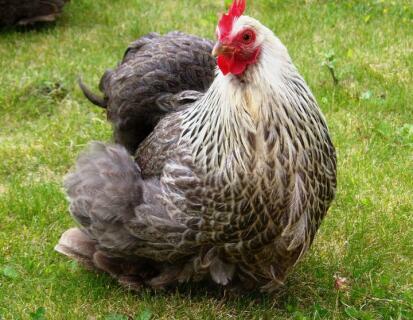 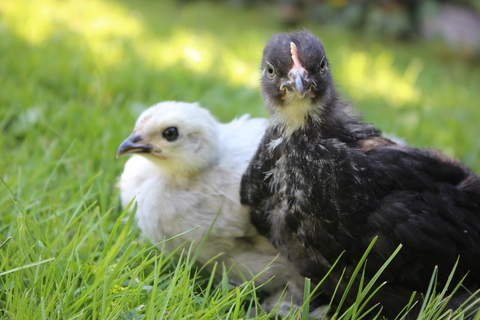 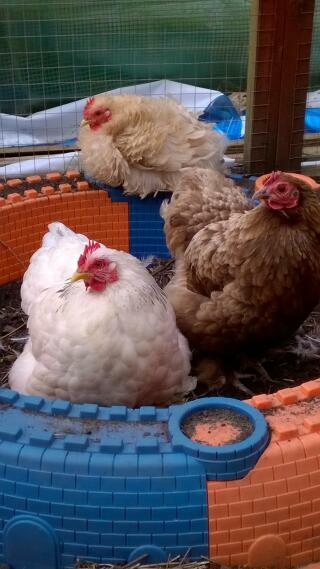 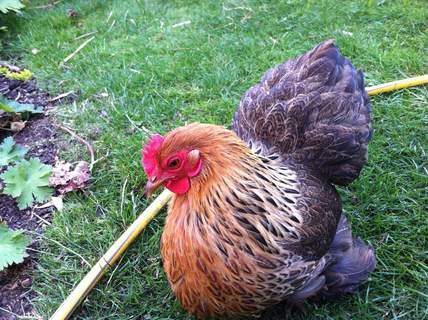 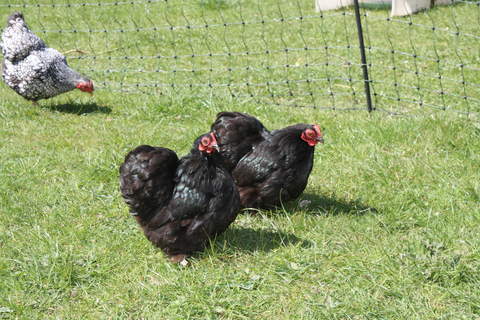 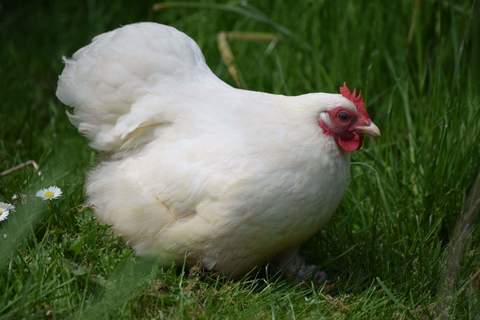 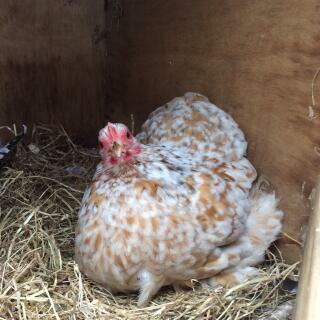 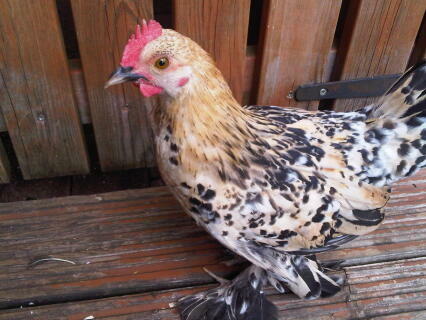 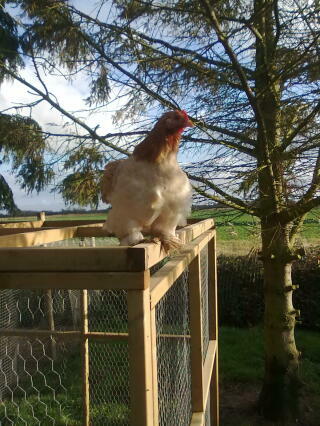 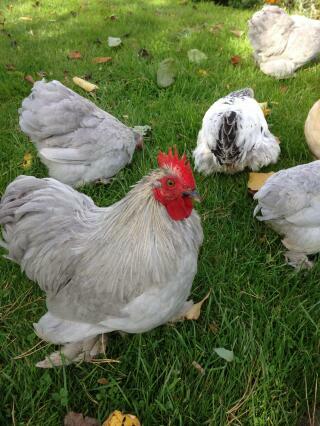 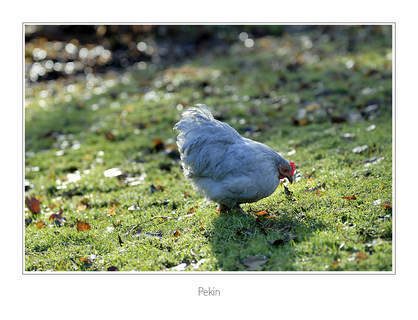 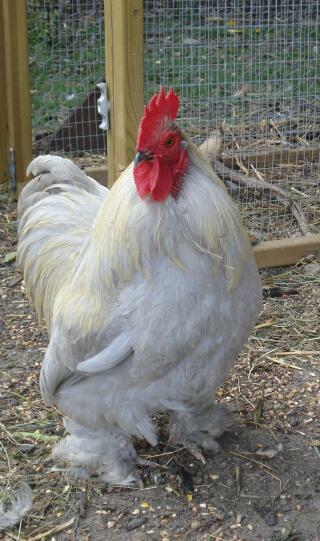 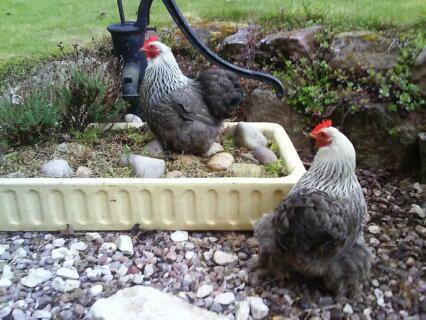 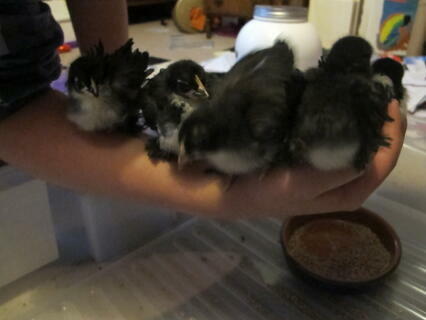 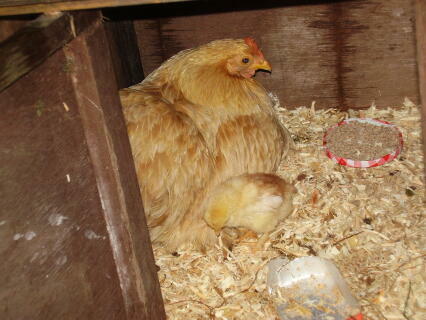 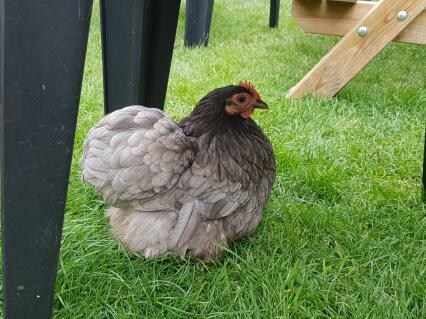 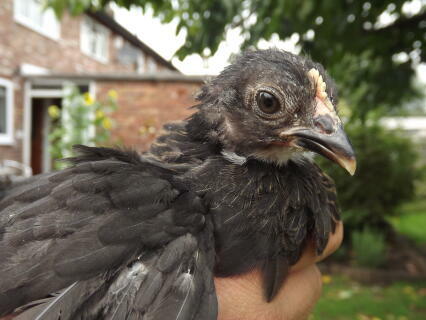 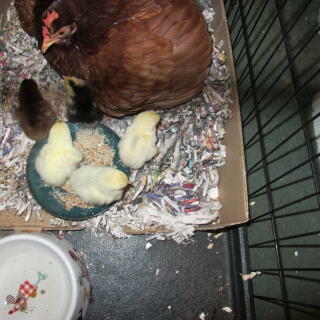 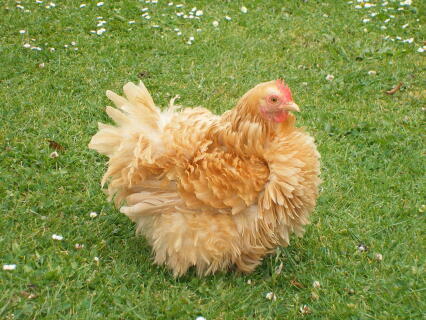 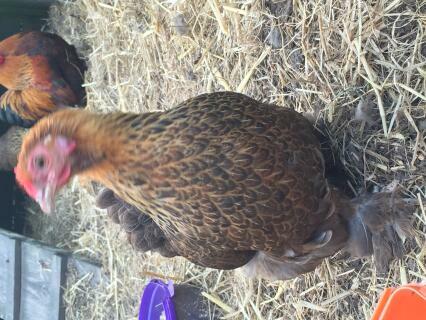 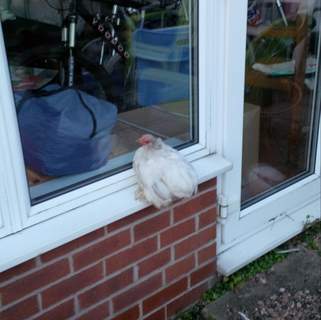 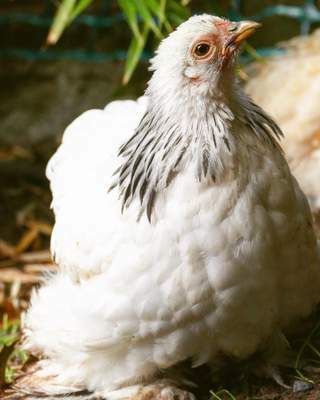 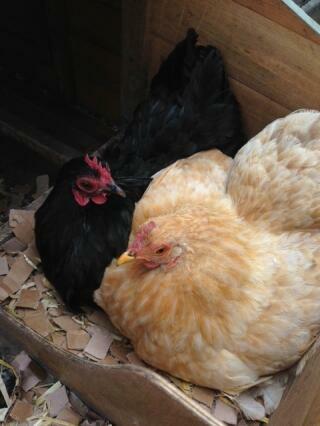 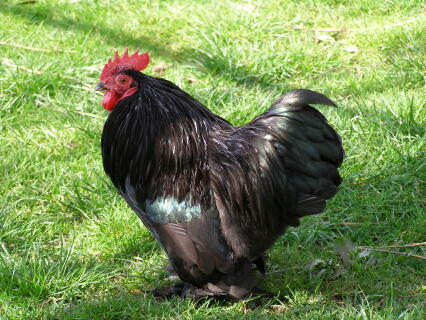 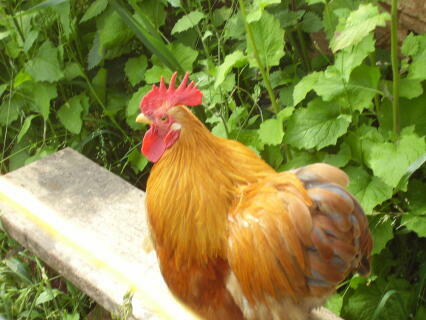 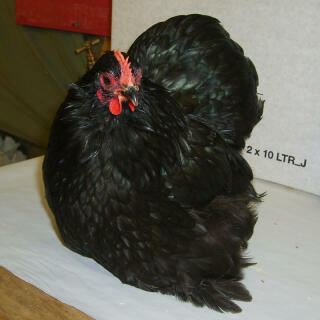 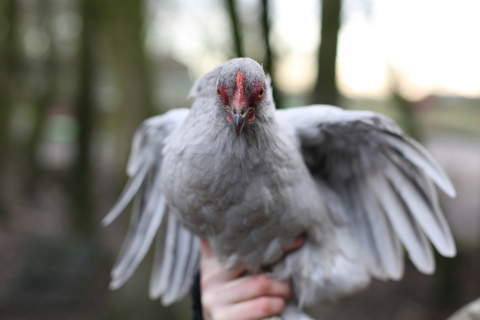 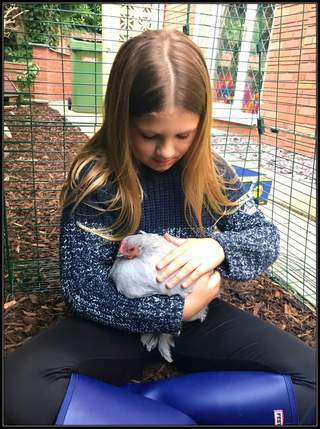 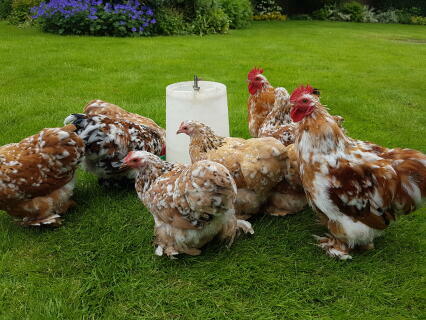 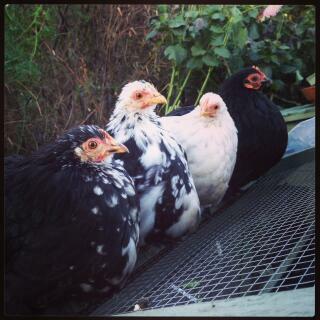 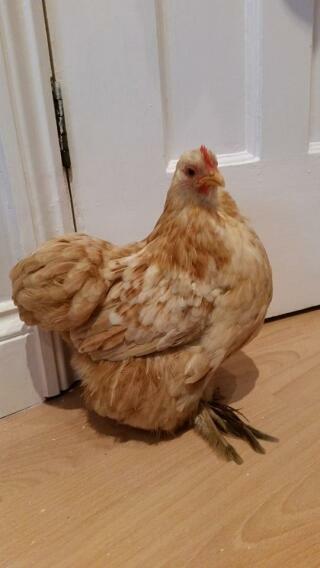 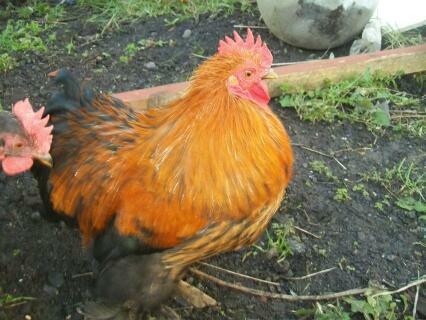 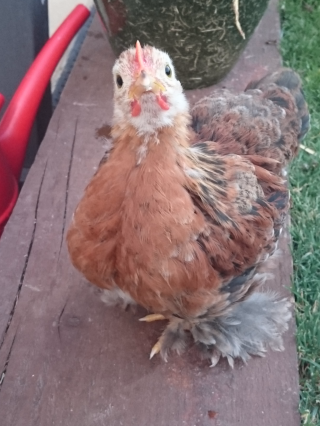 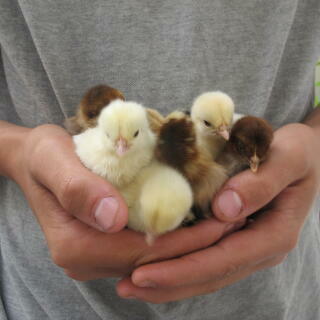 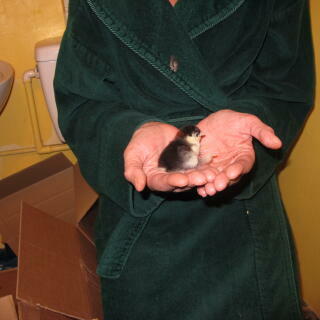 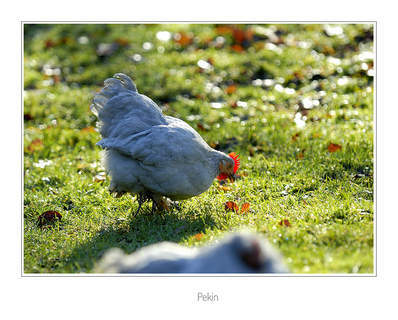 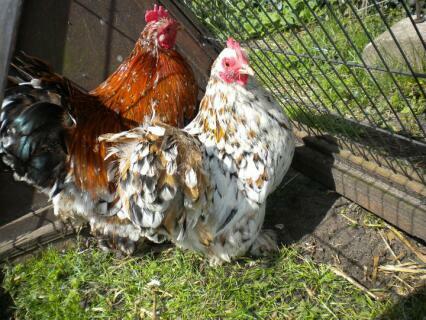 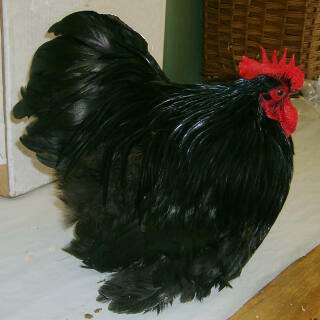 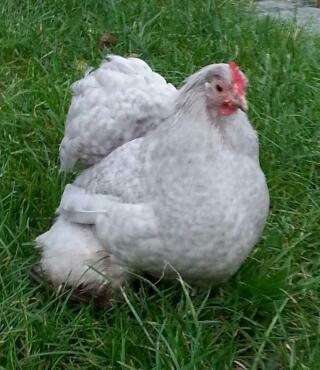 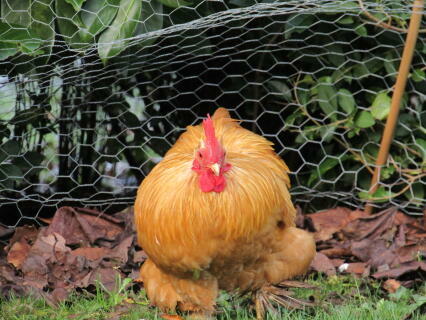 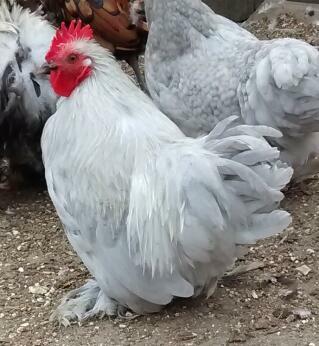 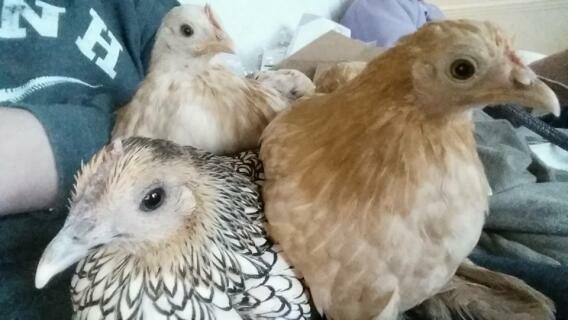 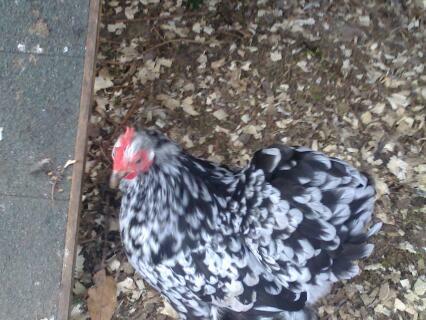 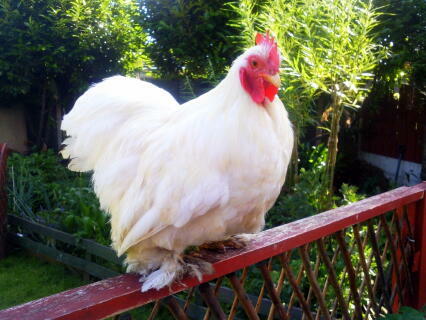 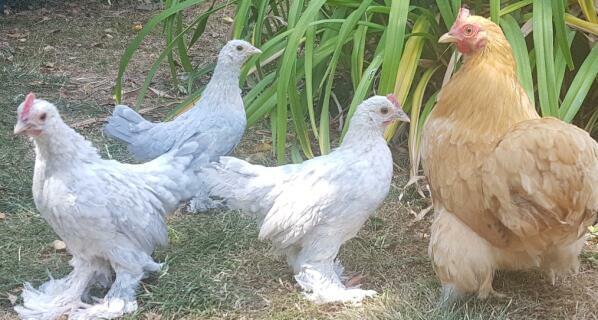 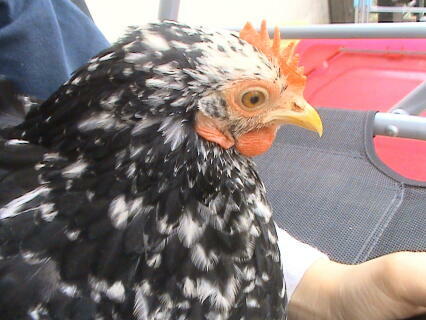 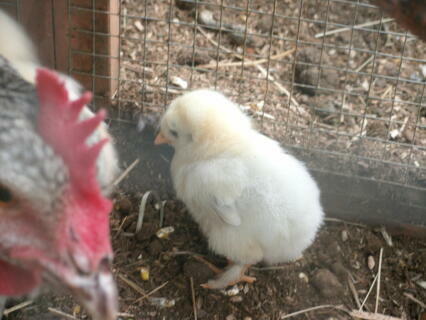 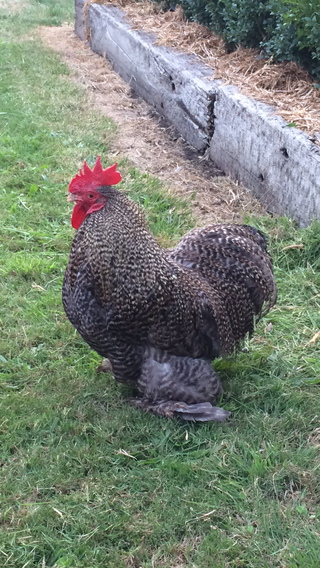 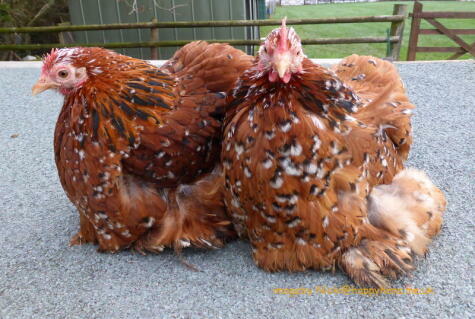 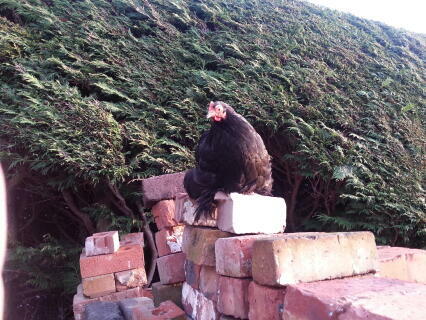 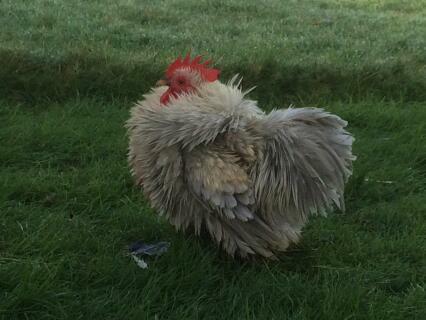 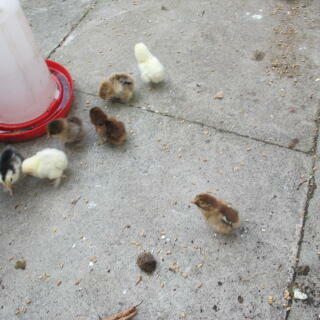 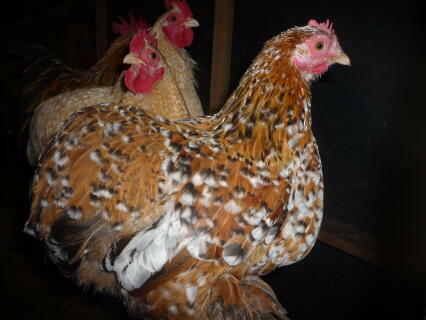 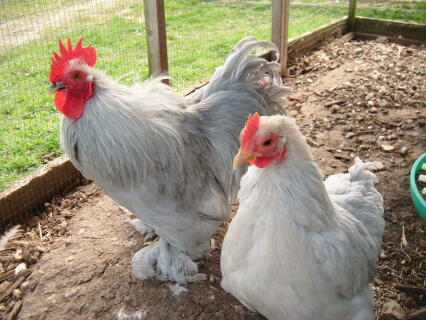 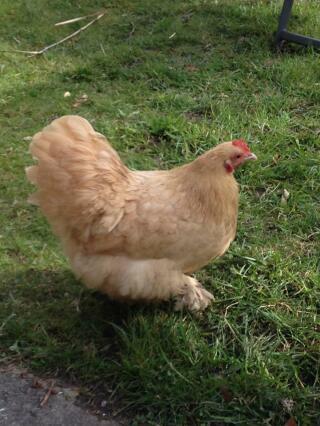 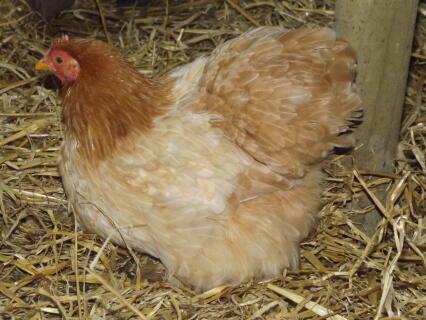 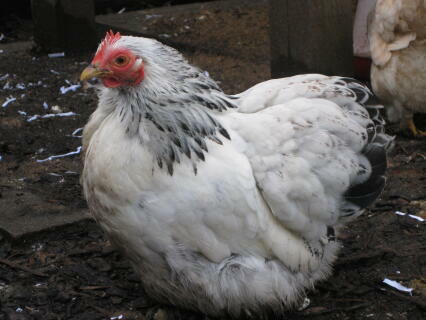 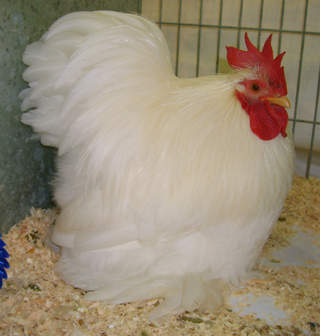 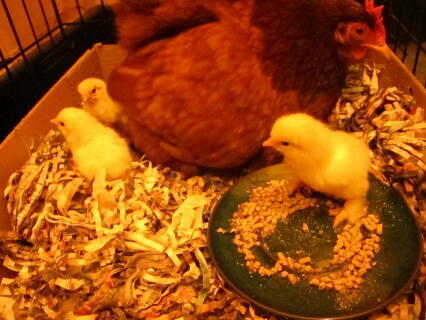 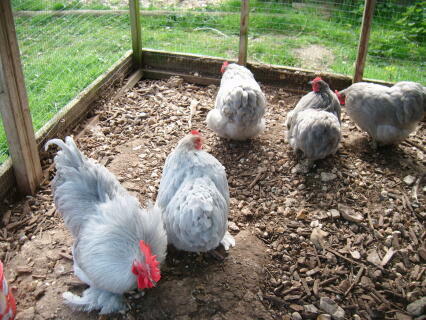 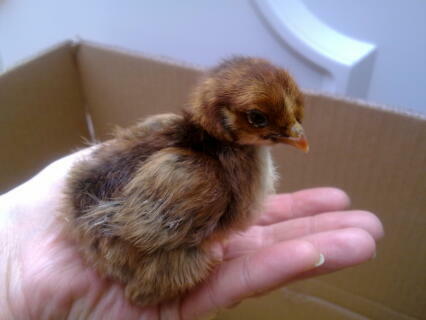 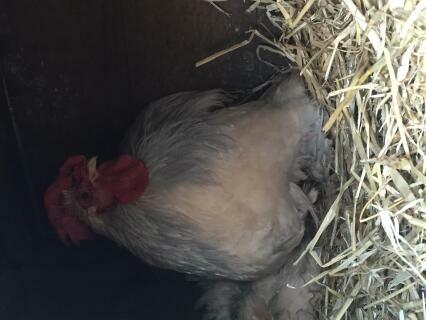 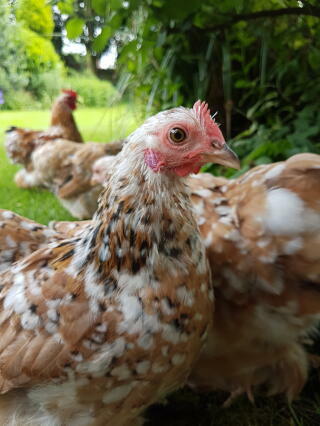 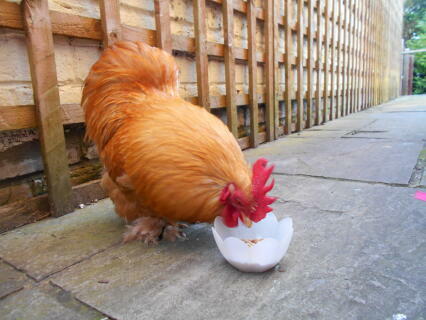 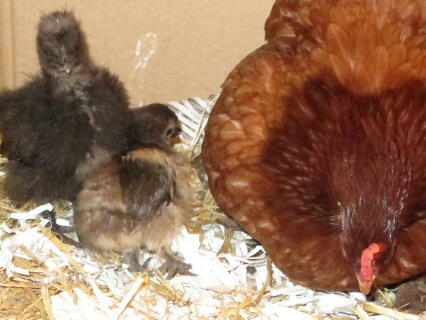 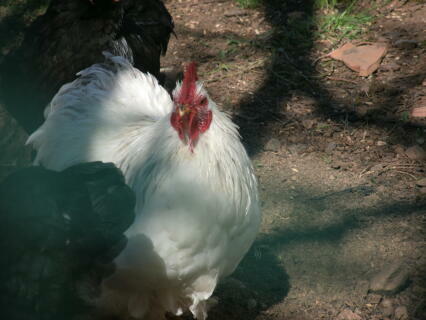 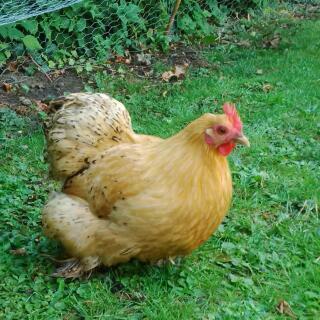 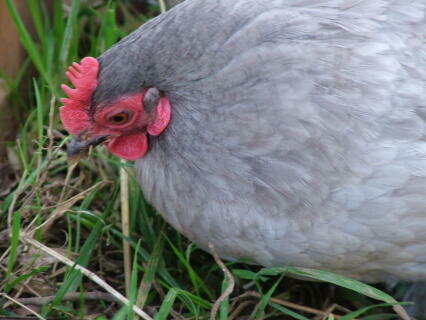 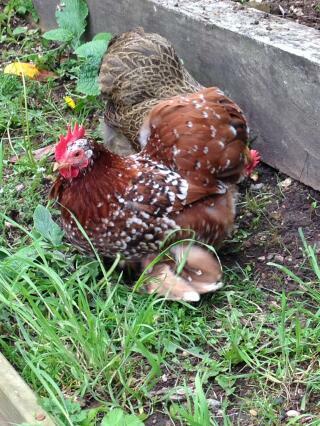 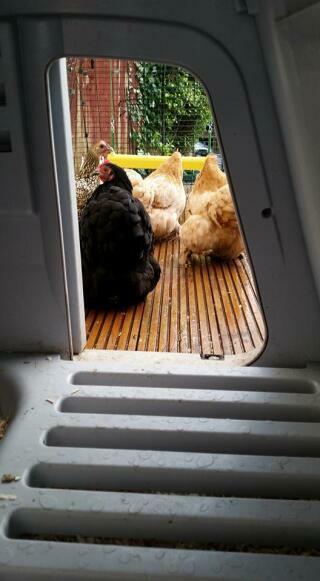 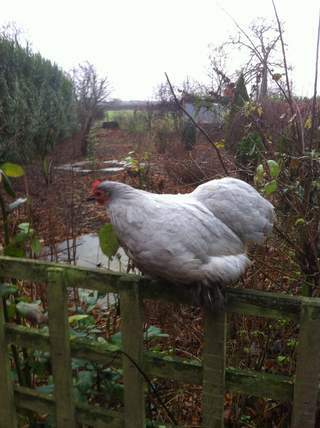 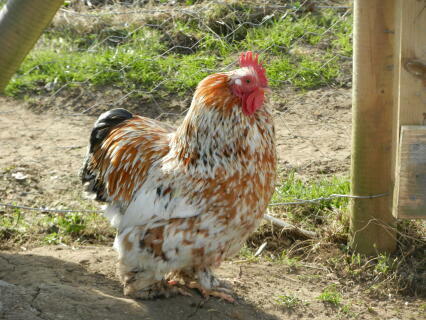 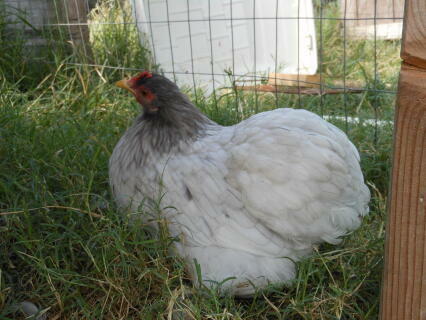 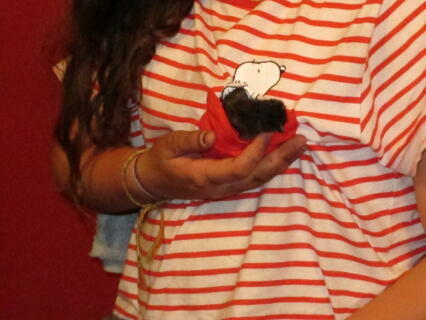 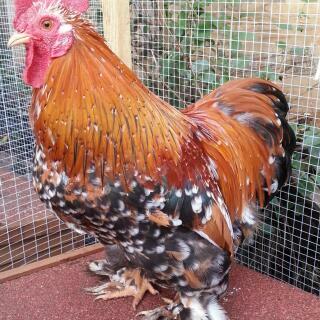 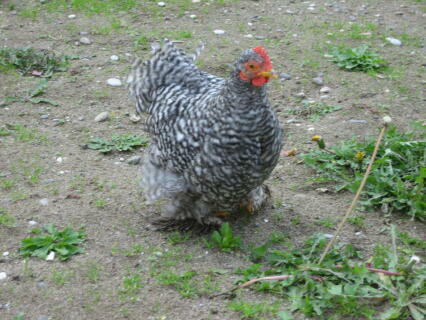 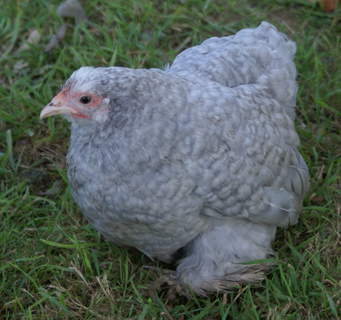 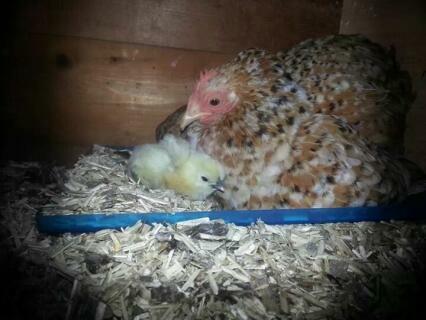 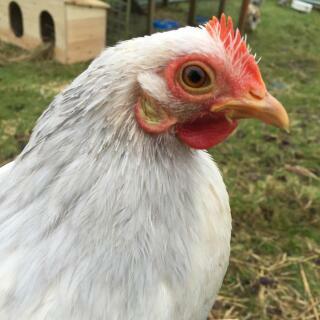 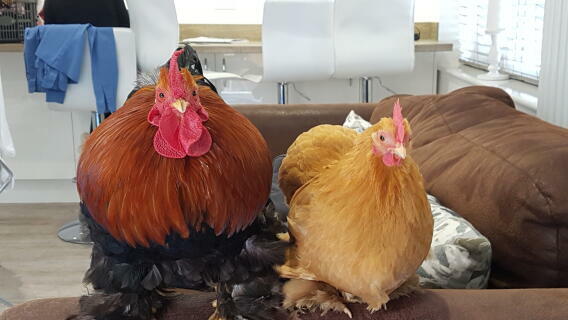 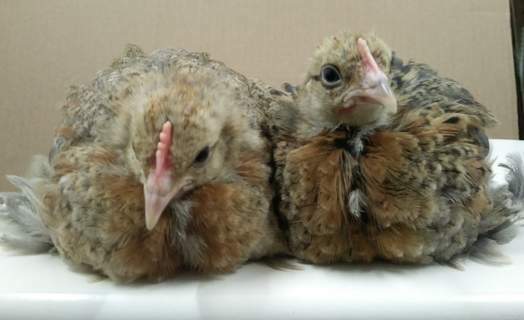 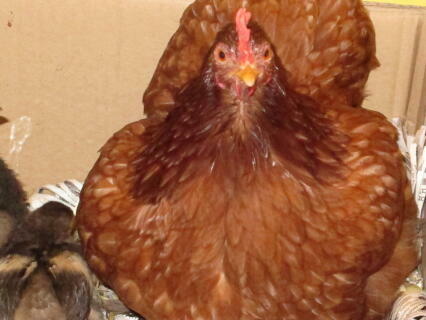 I now have 10 lovely buff Pekin or called here Cochin bantams. 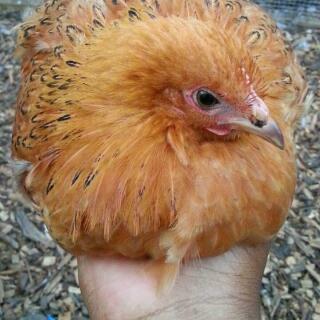 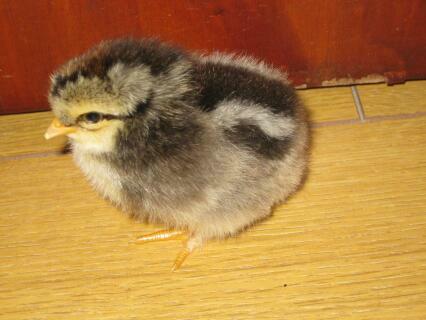 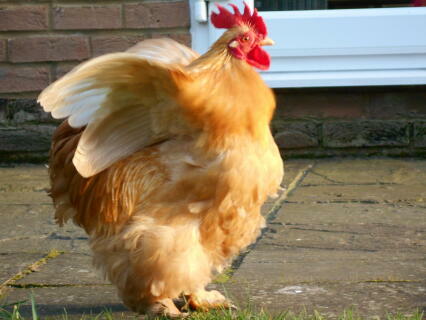 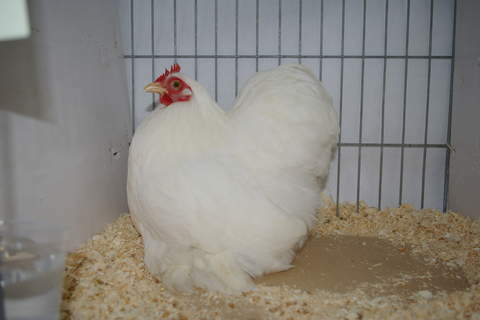 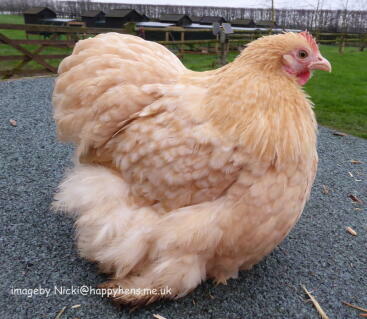 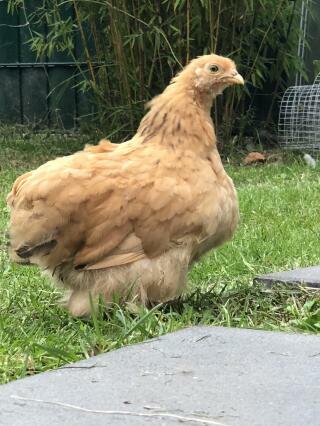 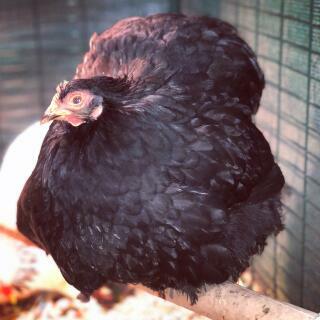 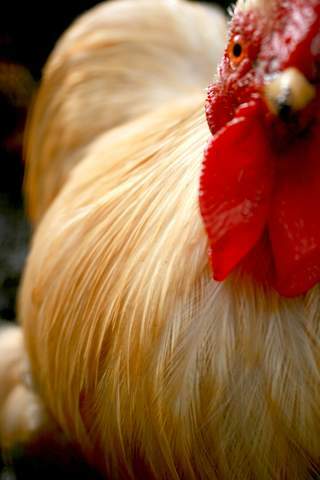 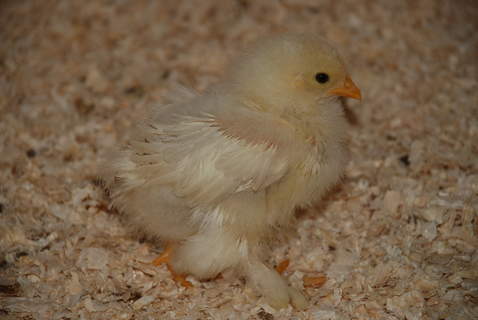 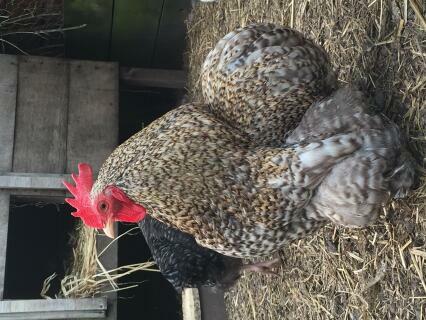 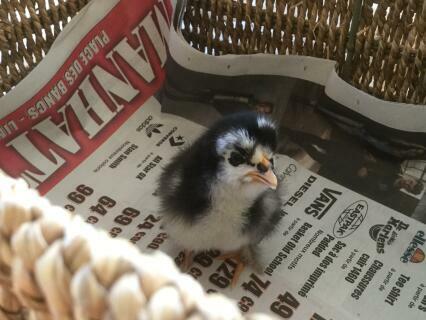 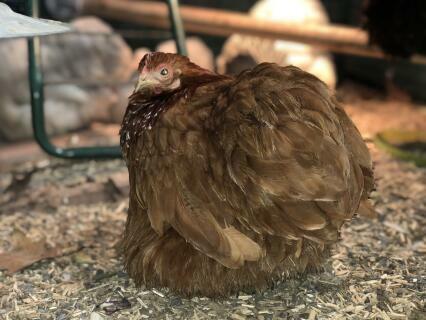 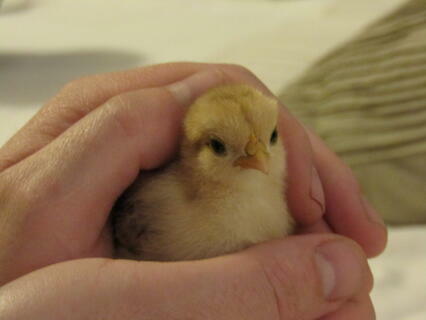 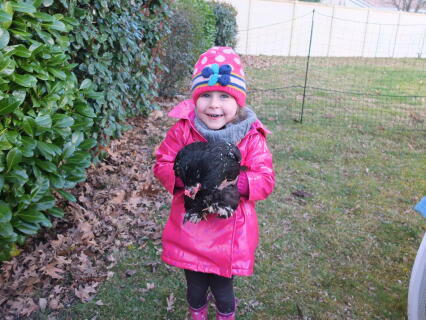 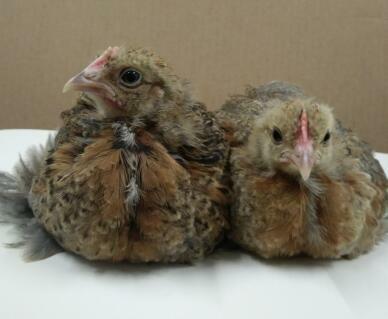 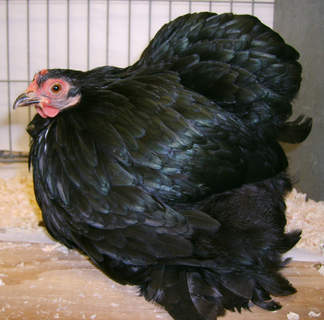 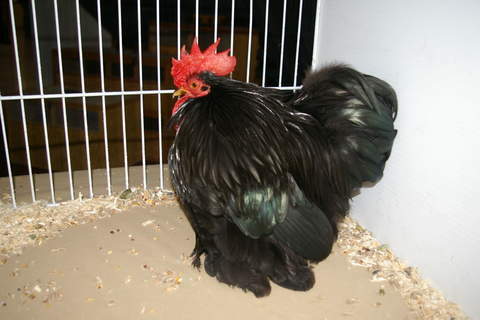 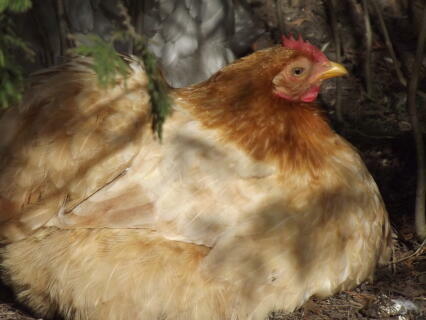 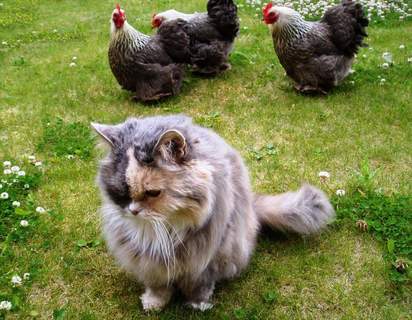 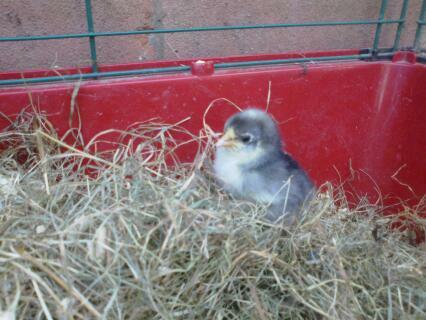 Much rounder and softer feathered than our British Pekin bantams. 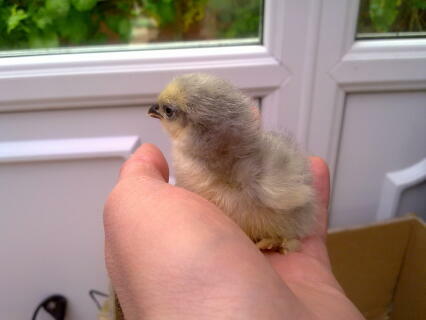 Bit larger also. 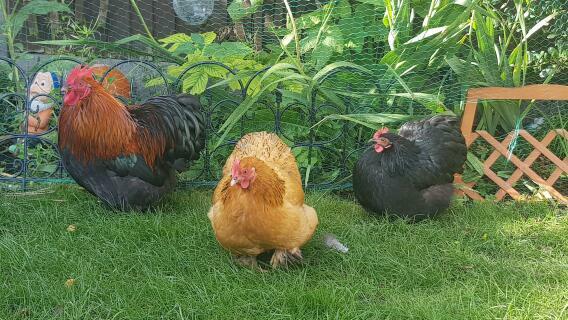 I have a landscaped garden and they love it. 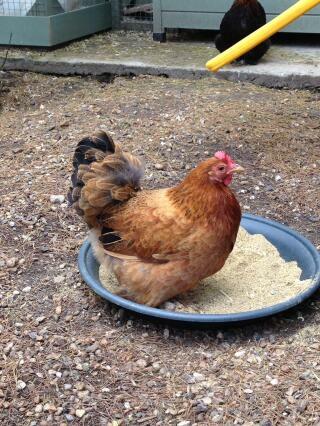 No damage or mess on lawns or borders as I grant them big sand and wood ash baths to bathe in daily. 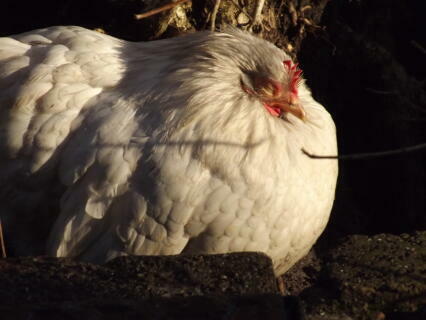 Good layers too even in hard winter. 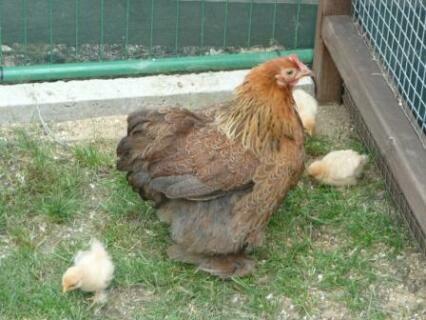 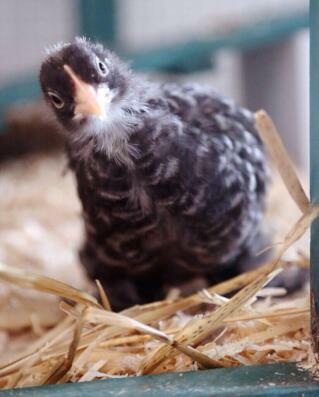 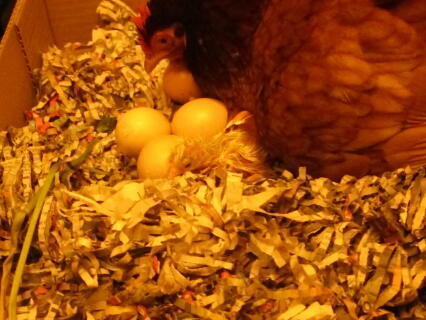 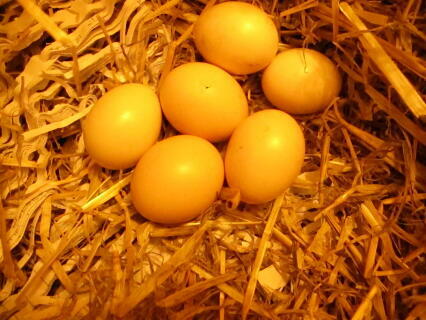 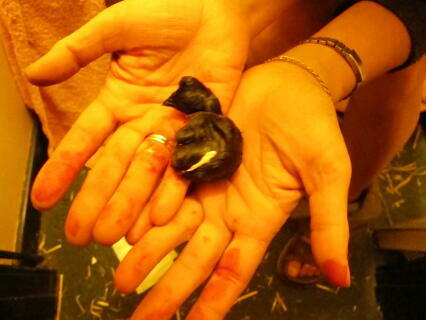 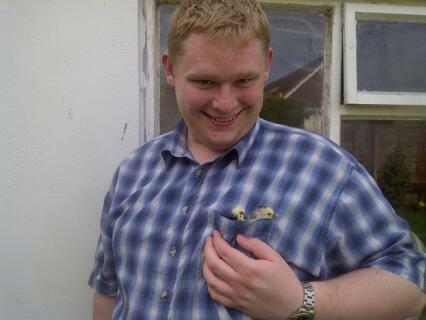 Not as good as bigger hens for job but eggs around 200 per bird a year is common. 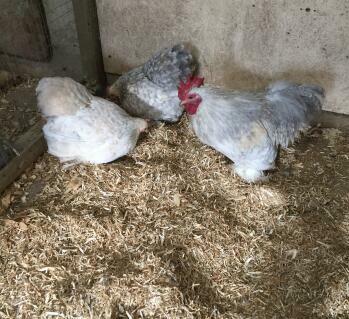 Pekin keepers say this cannot be until they call to inspect.Feeding oats and high protein layers mash with wheat corn for scratch. 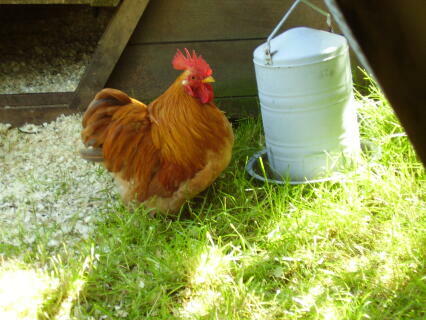 Worms are main meat scource in summer so feed beef chopped fine from roasts. 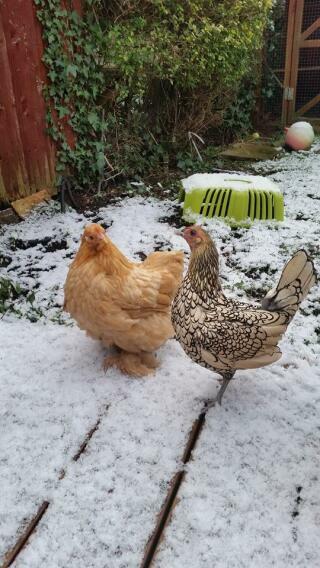 Give minced pork dishes almost still warm in deep snow days. 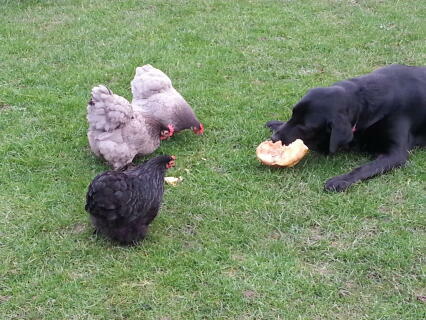 They love toasted berries and even good dog food in gravy. 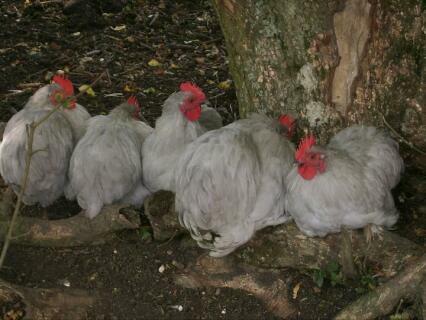 Rest of time they find their own in orchard. 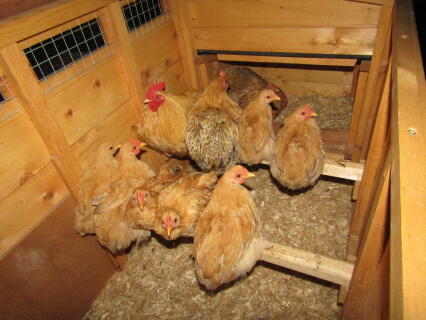 I built a great two level house with insulated cabin and play things like swings. 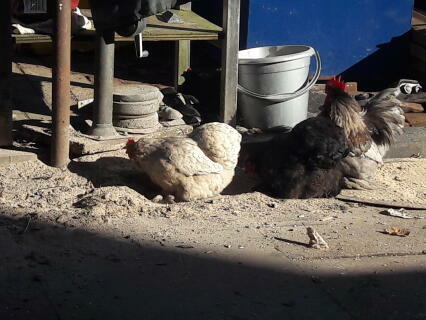 Enough space to allow exercise if I go out for shopping so as not to risk fox attack. 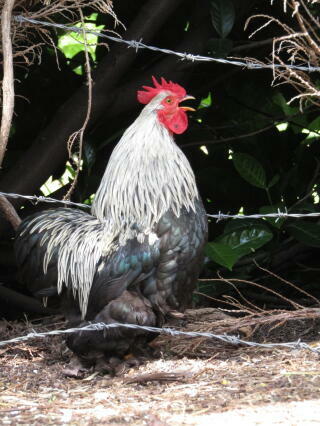 Living so rural has its advantage but town is a car ride away. 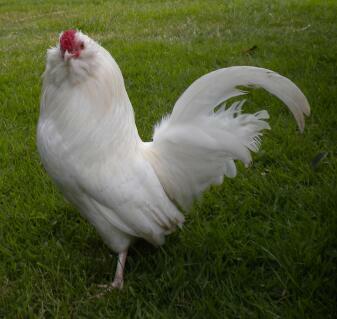 I want no other breed than what i have and love. 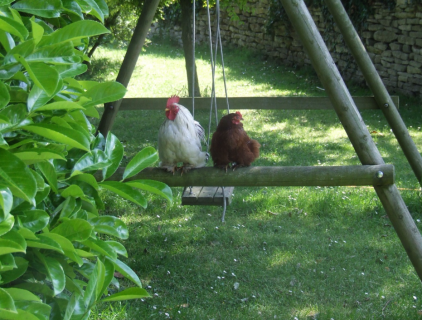 Like a fire brand they sweep across my view across the green velvet lawn to bring the gardens to life on early spring days. 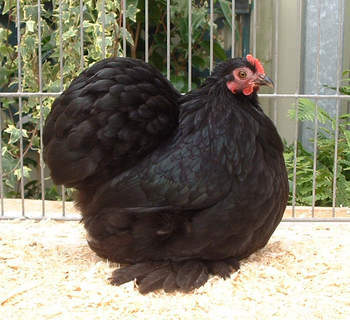 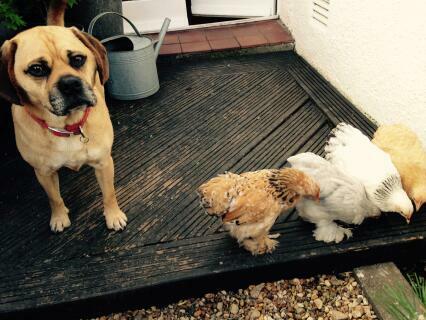 what a lovely breed to own. 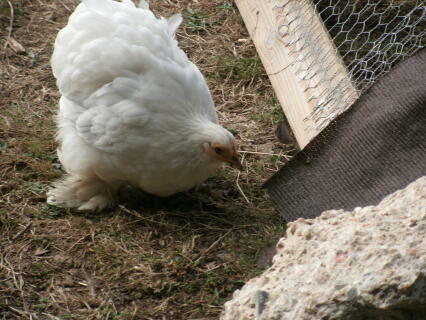 clean small tidy birds that look wonderful and walk like they're cross country skiing.